If verbal warnings to a loud neighbor or landlord do nothing to change the situation, use this written noise complaint letter for an apartment. 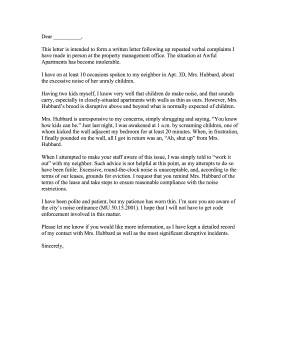 This letter is intended to form a written letter following up repeated verbal complaints I have made in person at the property management office. The situation at Awful Apartments has become intolerable. I have on at least 10 occasions spoken to my neighbor in Apt. 3D, Mrs. Hubbard, about the excessive noise of her unruly children. Having two kids myself, I know very well that children do make noise, and that sounds carry, especially in closely-situated apartments with walls as thin as ours. However, Mrs. Hubbard's brood is disruptive above and beyond what is normally expected of children. Mrs. Hubbard is unresponsive to my concerns, simply shrugging and saying, "You know how kids can be." Just last night, I was awakened at 1 a.m. by screaming children, one of whom kicked the wall adjacent my bedroom for at least 20 minutes. When, in frustration, I finally pounded on the wall, all I got in return was an, "Ah, shut up" from Mrs. Hubbard. When I attempted to make your staff aware of this issue, I was simply told to "work it out" with my neighbor. Such advice is not helpful at this point, as my attempts to do so have been futile. Excessive, round-the-clock noise is unacceptable, and, according to the terms of our leases, grounds for eviction. I request that you remind Mrs. Hubbard of the terms of the lease and take steps to ensure reasonable compliance with the noise restrictions. I have been polite and patient, but my patience has worn thin. I'm sure you are aware of the city's noise ordinance (MU 50.15.2001). I hope that I will not have to get code enforcement involved in this matter. Please let me know if you would like more information, as I have kept a detailed record of my contact with Mrs. Hubbard as well as the most significant disruptive incidents.